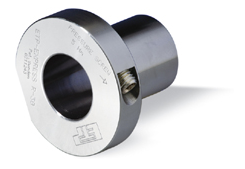 These locking bushes connect hubs to shafts on machinery where surface corrosion can be a problem, for example food, process and chemical machinery. EXPRESS type R is constructed in stainless steel and is available for shafts 15 to 60mm. EXPRESS type C is nickel plated for shafts 15 to 50mm. Both types are easily set and removed with the single radial pressurisation screw. ETP-EXPRESSS type R is made from hardened stainless steel. ETP-EXPRESS type C is match with chemical nickel, around 15 µm thick. The resistance to corrosion is further increased by the high phosphor content. The screw for both products is made from stainless steel. The transferable torque is lower as a result of the lower friction coefficients for nickel. Contact surfaces must be carefully cleaned before assembly. During assembly on a shaft or hub plated with nickel, the transferable torque is reduced by 50%. ETP-EXPRESS type R and C have the same functional properties as ETP-EXPRESS. Extremely fast assembly with only a single radial screw , small mounting dimensions, etc. All surfaces which may come into contact with the environment are made of stainless steel or coated with nickel. The simple cleanability is essential for use in the food industry. The pressure medium and lubricant for the screw are approved for use in the food industry.